It's been less than a year since Jeremy Scott was appointed as creative director at Moschino and has already made a massive impact in the fashion world. With his brilliant marketing plan, we saw items from the fall 2014 collection on editors, celebrities and bloggers just days after the show. Now, for his first Moschino advertisement he did something pretty iconic, a stunning photo of Linda Evangelista take by Steven Meisel. With a collection inspired but 80s and 90s culture, is was genius of Scott to hire one of the most famous supermodels of that era.The subdued black and white photo is a massive contrast to what I thought was quite a gimicky and fast food inspired collection. The quilted McDonalds bags looks almost classy in black and white, I love that Scott decided to show it in a completely different light. Although I'm not a massive fan of Jeremy Scott, I love that he is always doing something different an surprising. 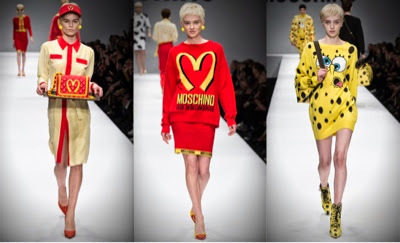 What do you think of Jeremy Scott's work at Moschino and his new campaign? Jeffrey Campbell is one of my favorite designers. he can go crazy but still keep you interested. Eclectic and young are how id describe his designs . I love the photos above! But his own fall 2014 line wasss waaaay better., but i do i love orange, yellow, fast food, and soingebob (its the kid in me lol) Omg 2ne1 are wearing the Jeffrey campbell fall 2014 designs in their latest music video and they look so amazing!! p.s. omg you have great taste in music lol.